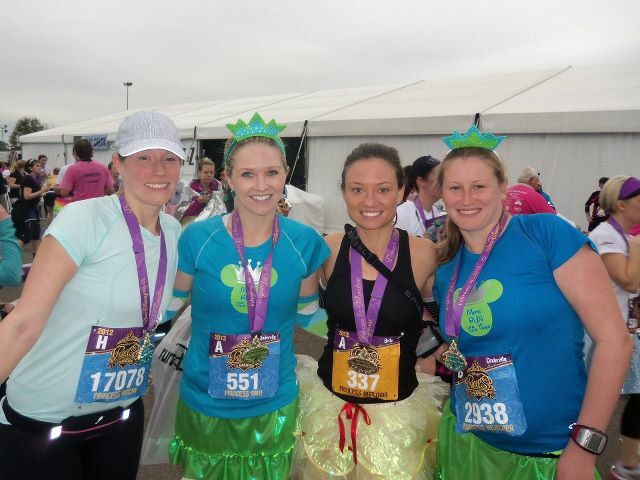 I was so bummed to finish the Disney Princess Half Marathon this year DISAPPOINTED :( I signed up a year ago and have been looking forward to it. It’s the most expensive half I’ve signed up for ($145 on early registration) plus throw in a $200/night “on location” hotel (thank goodness for 2 roomies to help buffer the cost), gas to get down there (my share alone was $75!) and that makes for one expensive race! After being bummed out the weekend and asking other runners their thoughts I realized my expectations were apparently too high going into the race. Those who enjoyed it said going into it they knew a majority of the race was run on the highway (Seemed like about 10 out of the 13 miles were on the highway or without Disney scenery in the back) and they went in with groups of friends to take pics and not focus on time. I assumed there would be camera men at the start taking cute pre-race photos of me and my friends like most races do… and didn’t see that. I assumed there would be characters walking around and fun back drops at the finish area for photos – and didn’t see that. I expected this dramatic finish line of characters/flags/glitter/princess magic – and completely missed Mickey and Minnie giving out high fives. Again – I guess all of this is my fault for lofty expectations – but when I kept hearing all these girls saying how AWESOME the race was – I just took their word for it. What I found was that if you are going into this race knowing about the highway miles and with the intentions of stopping to smell the roses, taking pictures where it was scenic, taking pics with the characters, run/jogging/walking with a friend or two, goofing off, and just making the race more about you and your friends – then it was good. 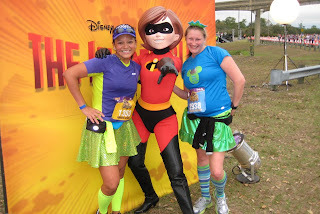 So….This is not a race to PR on (although it is flat) – this should be a girls weekend, a race to have fun with your friends, to meet friends along the way, to encourage friends who thought they could never do a half marathon… Think of it like a training run in costumes with some added characters and photo ops along the way. :) Go in with a FUN attitude – ditch the watch – and just finish with a smile on your face! With all that said – the review below is broken down below into a few sections. It’s not intended to be negative – it’s just REAL. I’m not saying not to do this race – but PLEASE don’t let this be a “serious” race or you may not enjoy it as much as it should be enjoyed!! 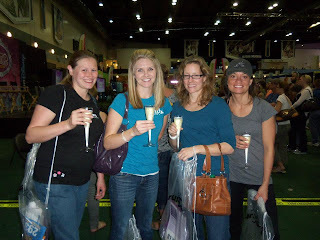 I did have a great time with my gal pals over the weekend for a kid free trip – but this review is for those who want to know what to REALLY expect before they sign up and to help you get a game plan before you go into it. I’ll start out and say I love free SWAG. I love getting a goody bag and filling it with free samples and finding cool new products. I heard this race had a great expo so once again my expectations were high. It was a LOOOONG walk to get to the expo (more training?? haha) Race bib pickup was good. Got our bibs, tested the timing chip and headed to the expo which was another walk to a different tent. Tshirt/bag pickup was in the very back but quick. T-shirts fit good and they are a girly fitted look which is so nice compared to race shirts I’ll never wear. They do let you exchange sizes if you need to which is nice. We found a little booth with champagne/beer which was fun considering this was a girls trip – so we got (paid for) 4 champagnes. First stop had free Luna Bars so we grabbed some. I was getting excited to fill my swag bag. We walked…. and walked…. and walked…. and no one was giving out any freebies :( Most of the booths were things I’d seen before… very few chances to ‘register to win’ stuff (I’m sucker for that) and then it was over. Hotel: We stayed at Disney’s Caribbean Beach Resort which they consider “On Location” meaning the buses will come pick you up at bus stops. This was in their “Moderate” list of hotels (meaning they have mini-fridges in the room). Price was $199/night – but we didn’t need the pool, beach, and later found out we didn’t need transportation since we drove down there. If you drive and are not going down without your family you may want to consider just a regular Mariott or something. At check in the staff didn’t know anything about buses race morning. We asked them a number of questions about where to go for the buses and getting to the race and they didn’t know anything other than reading off a very vague pamphlet. The rooms were outside rooms – not “inside” a hotel like I thought. I’m not a fan of rooms like that. The rooms were musty and of course we got the cheesy “Finding Nemo” room instead of the cooler “Pirates of the Caribbean” room…. and I didn’t see any “carts” or anything to help move luggage to and from the room. Bringing in baggage wasn’t a big deal but having to lug it back to the car after running was haha. I felt $199/night was overpriced for what we got – but again we didn’t use the beach or pool – and only attempted using the bus transportation once which proved to be a frustrating wait – but if you fly and don’t have a car down there it makes sense to use it. If you drive – it’s just SO much easier to drive everywhere. We waited forever for a bus to take us to downtown Disney – then when we were finished we had to wait again for the bus. Race morning: A little description of how our race morning went and tips for those who need to mentally prepare for their morning. If you decide to take the buses in the morning (which we didn’t thank goodness) I hope you are an EARLY morning riser and want to catch an early bus. The first bus starts at 3am and last bus is at 4am. When we left at 3:50am from the hotel we saw the bus stops were pretty crowded. If you decide to use Disney transportation I’d try to get on one of the earlier buses. Even if you ride Disney Transportation you STILL have to sit in the SAME traffic that we do as drivers so honestly I don’t see too much of a benefit from riding unless you don’t have a car there. We left the hotel parking lot at 3:50am and arrived at Epcot at 4:40. We took a little detour that was our fault for not reading road closures that took us 10 min to correct but we still go to the start line in time to go to the port-a-potties and get to corral A in time. KNOW what road to take in to Epcot -they tell you on the large flyer which road to take and which are closed. FOLLOW their directions. We had about 10-15ish minutes to stand and get adjusted before the race which was plenty of time. Heard the national anthem, hear the wheelchairs go off, see some of the pre-race stuff, etc. DON’T use the first set of port a potties you see when you first arrive (the ones right near bag check). Lines are MUCH longer there. Start walking to your corral and you will see at least 2 more long rows of port-a-potties before you get to your corral. Lines are much shorter. It DOES take about 20 min to get to your corral once you get to the Epcot parking area so make sure you prepare for this. You walk on dark, narrow, cram packed access roads – not a glamorous walk by any means but once you actually get to the corrals it thins out. Traffic IS as bad as they say…. so plan accordingly. We did a “test drive” the night before that took us 12 min and on race morning it took us about 45min driving our own car. Even if you take the buses you will still have to wait in traffic. Gear check was good. Bring your bag from the expo with the sticker they provide – drop off is easy and bag pick up after the race was easy but the gear check is BEFORE you start your 20min walk to the start corrals so just know that if you want a warm up shirt/blanket – bring something you can toss because you wont get it back or you will have to carry it the whole race. It would be nice to throw a shirt in the bag for after the race in case it’s cold because they DID NOT give out silver heat sheets and it WAS cold!!! The Race: Just a reminder and brief summary – consider doing this race as a fun/group event with no regards to your finishing time. Now that it’s over I SO wish we had just stuck together as friends, stopped along the way taking pics and had fun – not set out for a time goal. Most important: SUBMIT A PRIOR RACE TIME. If you are planning to run submit ANY race time to get in a higher start corral or you will be starting in the very back and you will have a wall of people to try to get around. Even if you do a race after you register – you can go back and email them a race time. HOWEVER – I will say that starting in Corral A means you are running in the dark and it’s still dark when you get to Cinderella’s Castle – if you start in the back and take your time you can run through the park when it’s actually light outside. Yes you “start” at Epcot (and by that I mean you use those entry gates and park in the lot) but you immediately leave to start your 20 min walk to your corral via dark/narrow/packed access roads. Don’t expect glitz/glamor at the start. Starting line is pretty un-eventful. You may see Jeff Galloway and the emcee on the screen if you are lucky enough to have a screen near you…. but that’s about it. They did shoot some little fireworks at the start of each corral though. Corrals are NOT by expected finish time only – they also factor in how many Disney races you have done before so even though we submitted times for Corral A – we had a good number of walkers and slower folks in our group. It made it frustrating if you were planning to run for a time goal because there was a LOT of weaving. But as I said before – don’t try to PR on this race. The first 3 miles were very dark and highway/boring/uneventful miles. Nothing to encourage you or cheer you on. Finally as you near the entry to the Magic Kingdom you will see a few characters (with about 6 deep of girls waiting for photo ops). There was about 1/8th mile of cheer stations where you will get PUMPED thinking YEAH, THIS is how it will be!!!! And then the cheering is over for another stretch of dark boring miles before you actually enter the park. There you are greeted by about 1/4 mile of cheering fans where you get PUMPED AGAIN before it ends. Very little crowd support along the way. Again – if you are talking with friends this isn’t a big deal. You have about 3 good miles of running THROUGH Disney – although all the attractions/stores etc are closed with covers over stuff making it look like a ghost town . If you start in corral A and run it will still be dark at this point… if you want good pics you may want to start in the back of the race so you have time for it to get lighter outside! But enjoy the scenery, take photos, LOOK FOR PHOTOGRAPHERS (or know where they will be ahead of time) because this is really the only place there are photographers until the finish. I think they announce for photographers but if you have headphones on you may not hear this. You run through the castle which is cool. They blow trumpets as you run under, there are the majority of the camera people around this area obviously because it’s the most scenic… Make sure you leave PLENTY of space between you and others around you so the camera guy can see you. After your 3 miles of fun prepare for about 6 more miles of NOTHING. Yes, there are characters sprinkled around – but it’s like literally 1 or 2 characters on a backdrop. It’s VERY sparse. You run the rest on long boring flat roads, access type roads and the highway. No cool scenery unfortunately. Bathroom/port-a-potties are pretty far off the course so plan to run through grass to get to them. I was planning a stop until I saw how far off the road they were. Water stations were good – plenty of water/powerade and plenty of volunteers to hand it out. They had a GU Energy Gel station with lots of flavors. I don’t care for the gels but I had my GU Chomps with me so it was cool ;) Nice that they were out there though. More boredom until mile 12 when you start through the parking lot to Epcot. I was expecting an EXCITING last mile but was disappointed. There was a choir at mile 12 which was cool then started a very winding path to the finish. Finish was sadly a disappointment. We were routed around the BACKS of buildings past DUMPSTERS twisting and winding our way to the finish where there were volunteers shouting “Only ONE more mile” every tenth of a mile which was pretty irritating because when you are running and you have only half a mile left you don’t want to hear “Only 1 mile left!! !” They REALLY need to know how much is left before they yell stuff. Finally I get to the end (after thinking I hit it about 3 times prior) and there were THREE stomp pads which confused me. I couldn’t see the photographers and completely missed them – and they missed me with my excited “finish face” on. You are ushered to get your medal which is given to you by cute little old-men volunteers (although a princess or character would have been much more appropriate in my opinion but who doesn’t love little old men???). Then pushed to get your finishers photo (look cute the first time – they only take one them move you on). Expect warm bottles of water…. And they give you a little box of healthy snack foods (including hummus?? kinda random), bananas, and protein bars at the end – but your arms are literally loaded with stuff that is awkward to hold. Would have been nice to have bags to put stuff in so you can take it to an area after to the race. 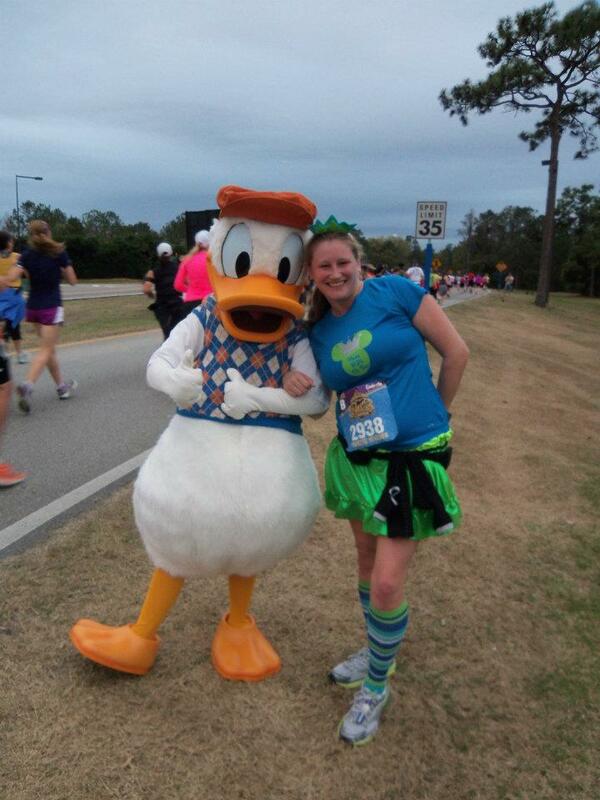 The only characters I knew of at the finish were Mickey and Minnie – but as I said I didn’t even see them. Looking back at the video I ran straight through them and people were high fiving them so I must have just lost them behind people. Being a DISNEY and PRINCESS race I expected there to be MORE characters there at the finish cheering you on and definitely some at the finish area for photo ops. After we collected our friends we didn’t see the big open area past baggage check so our group photo just had a white tent backdrop (better than the port-a-potties) but even in the big open area I don’t know if they had backdrops or characters walking around – I surely didn’t see them. Bag/Gear check was an easy pickup process. Have more girly things at the expo. It’s mostly women there – we like girlie stuff and swag… or at least I do. It would have been fun to have a photo booth where you can take crazy pics with your friends. Make the walk to the starting corrals more exciting. They apparently had someone at the photo spots announcing the photographers ahead… I had my earphones and between that and the loud music they had playing I didn’t hear it – maybe signs or something?? Have characters/flags/streamers SOMETHING at the finish line to make it dramatic. I can’t tell you how jealous I was of the “winners” photo where she got confetti and had Micky and Minnie there waiting. THAT’S what I wanted. There was even a red carpet and row of flags outside at the parking lot – THAT would have been more fun than what the finish line was. Give away cheap plastic bags to put all the food stuff in when you finish. My hands were packed and I couldn’t hold everything. Have characters and/or backdrops at the finish area to take pics. I would have loved to see characters walking around at the finish area for photo ops since I didn’t want to stop while I was running. I didn’t even know they had a 2nd area at the finish line through the baggage check that was more spacious – would have been nice to know so we could have spread out a bit when we were done. GIVE AWAY THE HEAT SHEETS – they cost pennies and they were NEEDED at the end of this years race. I can not believe that so many other races that are MUCH cheaper will give these away like water – but yall wouldn’t do it even after my poor freezing friend ASKED the massage tent for one. This is a princess race and I know that most people bring their own tiaras/boas/etc – but the Divas Half Marathon Series is not only cheaper but they also give away boas, tiaras, roses and champagne. Even if someone was there the morning of the race in the big open area offering glitter/face painting SOMETHING princess-y. TRAIN hotel staff and gate agents (Epcot gate agent didn’t know anything either) about road closures and bus schedules or give them a private number to call for exact info. NO ONE knew anything and yes, we could read on the paper but we needed clarification and no one knew anything. If you are a walker or beginner runner who thinks you will NEVER finish a half marathon – I’d say this race makes it possible to achieve your goals. You will find plenty of beginners and walkers so you will be in good company. OR if you can gather a group of your friends to walk/jog/slow run it with you, stop for goofy pictures at every station and do not take finish time into consideration you may enjoy this race. If you are looking for scenery, loads of princess atmosphere, pomp and circumstance, crowds cheering, bands playing, excitement, etc – you are looking in the wrong spot. I also would not recommend this race as a PR race unless like I said you work your way to the VERY front where the “elite” athletes would start because you will be trapped by slower runners. While it is flat for the majority of the race, the boring lack of scenery is demoralizing and wont keep you motivated. Would I do this race again? Not unless I got an amazing hotel deal and a free entry to the race AND had great gal pals to goof off with me along the route. Hate to be negative… I REALLY wish I had gone in to it with less focus on time and more focus on FUN… and have been sitting on this review forever – but a few friends were asking what to expect so I figured I’d just put it all out there. I have to agree with almost everything you said Pam. We moved to FL last July and I was so stoked to be able to run this race. I did actually set a PR on my half of about 7 minutes WHICH was HUGE for me, but it was because it was the best weather I’d run in so far temperature wise. I too thought the EXPO was shabby compared to others (Houston has been the best I’ve experienced) and all the WALKING to get to everything. I had gone up on marathon weekend in January just so I knew what to expect for Feb and that helped. What I hated most about the race was the continual elbow bumping for the WHOLE course because there are just so many runners and only one lane open. My little sister came down for the Princess and she enjoyed the fireworks at the beginning. And since she had never been to Disney even the little glimpses were cool for her. We got up at 2 am and drove an hour to get there, but the drive & parking were uneventful. We didn’t hang around at the end because we too were cold, but I heard in the parking lot (after the race) that you could get a heat sheet at the medical tents – I thought they should be handing them out too. 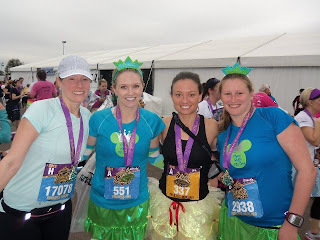 Our biggest mistake was going to the race corrals when we were supposed to and walking right past the last pottapotties and then not getting back out to go – so of course we had to stop on the course. Will I do this race again – NO – however I am running the 20th Anniversary Marathon in January, just for the bling. Great info! This race is going to be the first one my daughters and I do together. We just started training. I would strongly suggest you send your comments to Disney. They are often quite appreciative of any input and respond quickly!